As casualties from the Ebola outbreak continue to rise in West Africa, the deadly virus has spread to a handful of victims in the United States and Europe. As a result, some countries have moved into high gear to prevent the spread of the disease within their borders. A number of governments, including the United States, have initiated additional screening of travelers arriving from the three countries at the center of the outbreak: Guinea, Liberia, and Sierra Leone. Increasingly, there are calls for bans on travel from the affected countries and to restrict the admission of these nationality groups. In an era of global travel, the response to the Ebola crisis once again brings to light the use of immigration restrictions to control the spread of disease, as well as reviving debate over the wisdom over such travel limitations and possible unintended consequences. To date, the Ebola virus has infected more than 9,930 people, with 4,877 deaths reported as of October 19, primarily in West Africa. The World Health Organization (WHO), which has projected 10,000 new cases per week by December (up from about 1,000 cases per week currently), has called the current outbreak “the most severe, acute health emergency seen in modern times.” While other serious diseases such as malaria, AIDS, and tuberculosis (TB) remain far bigger killers in the region, the Ebola virus is seen as particularly brutal, fast-moving, and difficult to contain. There is no known cure or vaccine that has been cleared for use, and the disease has a 70 percent fatality rate. Although only three individuals have so far been diagnosed with Ebola in the United States (five others were brought to the United States for treatment after contracting the virus abroad), the disease has generated tremendous fear and anxiety. The first U.S. Ebola case was a Liberian national who had traveled from Liberia to Dallas, fell ill after arrival, and ultimately died. Two nurses who cared for him also contracted the virus. All three could potentially have exposed others, resulting in monitoring of hundreds of people by the Centers for Disease Control and Prevention (CDC), and the decision by communities in Ohio and Texas to close several schools amid concerns that some students were on a flight with one of the nurses. New Ebola cases in the United States are expected. Hospitals across the country have taken extra precautions to prepare, particularly in areas with significant West African-origin populations. President Obama has appointed a coordinator within the White House to oversee the national response to the disease, and has deployed 4,000 troops to Liberia to carry out operations providing medical, logistical, and security support, and to build treatment units for Ebola patients. As the Ebola outbreak triggered much public anxiety, U.S. political leaders have begun pressing for a variety of stricter travel controls, including a complete travel ban, for those arriving from affected countries in West Africa. Thus far, U.S. officials have helped governments put exit screening in place at airports in Guinea, Liberia, and Sierra Leone, including administering Ebola questionnaires and taking temperatures. U.S. Customs and Border Protection (CBP) and the CDC have instituted similar heightened screening procedures for travelers coming from or through those countries at five U.S. international airports: Atlanta’s Hartsfield-Jackson, Chicago’s O’Hare, New Jersey’s Newark Liberty, New York’s John F. Kennedy, and Virginia’s Washington Dulles. On October 21, the Department of Homeland Security (DHS) announced that all passengers arriving in the United States whose travel originated in Guinea, Liberia, or Sierra Leone are required to fly into one of the five airports where enhanced screening is in place. Initial DHS estimates indicated that approximately150 travelers arrive in the United States daily from the three affected countries. These travelers will be actively monitored for Ebola-like symptoms by state and local health officials for 21 days after arrival. take the traveler’s temperature, and if symptoms are present or the passenger may have been exposed to Ebola, refer the individual to CDC for a health assessment where it is determined whether further steps are necessary. prepare the traveler for monitoring by public health officials for a three-week period. 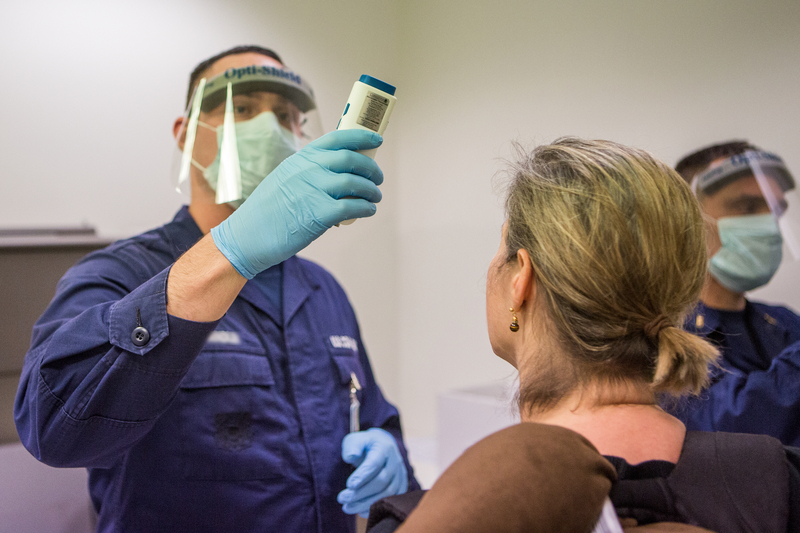 The new measures are an extension of the long-standing dual CBP and CDC role in health screening at ports of entry. CBP officers are trained by the CDC to recognize illness, and several U.S. airports have on-site CDC staff and quarantine stations. The CDC can also issue “Do Not Board” notifications to CBP for individuals the agency determines to pose a public health threat. Despite these long-established and new measures, many have argued that the heightened screening is inadequate and are calling for a travel ban from the affected countries. According to a Washington Post/ABC News poll, two-thirds of Americans support such a policy. On October 20, Senator Marco Rubio (R-FL) became the first senator promising to draft legislation immediately banning travel visas for individuals from Guinea, Liberia, Sierra Leone, and any other countries with significant numbers of Ebola infections. Earlier, three House Republicans pledged to introduce similar legislation when Congress reconvenes. A growing number of African countries, including Cameroon, Gambia, Ivory Coast, Kenya, Nigeria, and Senegal have halted or limited air travel from Guinea, Liberia, and Sierra Leone. Several airlines have also suspended flights to and from the region. South Africa recently announced that all noncitizens, including permanent residents, traveling from Guinea, Liberia, and Sierra Leone will be turned away at the border. President Obama and U.S. health officials have strongly resisted calls for a travel ban, citing concerns that halting travel from West Africa would be counterproductive, devastating economies in the region and beyond, and impinging the flow of medical supplies and personnel to the affected countries. Furthermore, CDC Director Tom Frieden has stated, “isolating countries won’t keep Ebola contained and away from American shores ... People will move between countries, even when governments restrict travel and trade. And that kind of travel becomes almost impossible to track.” A travel ban, he argued, would incentivize those wishing to come to the United States to cross porous borders in West Africa and transit through and depart from other countries to arrive in the United States while concealing their original point of departure, endangering other countries and undermining screening and monitoring efforts by the CDC and other countries. Immigration restrictions have been used to protect the United States from disease and pandemics since the enactment of the 1891 Immigration Act. That law established for the first time that foreign nationals could be denied entry into the United States on health grounds; the list of health-related grounds has been periodically modified over the years. Currently, under the Immigration and Nationality Act (INA), health-related grounds of exclusion and inadmissibility apply to those seeking entry to the United States: 1) with a communicable disease of public health significance; 2) without documentation of a required set of immunizations; 3) with a physical or mental disorder associated with dangerous behaviors; or 4) who are drug addicts. By regulation, the Department of Health and Human Services (HHS) may specify which illnesses qualify as “diseases of public health significance.” The category currently includes a bevy of Old World and modern illnesses, ranging from leprosy, plague, and TB to Ebola, Severe Acute Respiratory Syndrome (SARS), and pandemic influenza. To prevent the spread of disease, all foreign nationals who seek a U.S. visa are questioned and screened prior to their arrival; and anyone applying for refugee status or permanent residency—from within or outside the United States—must pass a medical examination and undergo tests for both TB and syphilis. While health-related inadmissibility grounds have the primary goal of stopping the spread of disease, the United States has also justified them from a public cost point of view. Under the INA, the United States may also bar noncitizens from entry who, for health reasons among others, are likely to become a public charge (i.e. someone who will be primarily dependent on the government for subsistence, including cash assistance and or long-term care at the government’s expense). Historically, the U.S. government has taken severe and sometimes highly controversial measures to restrict foreigners perceived to be a health threat. From the late 1800s into the 1900s, fears arose that certain immigrants—including the Irish, Jews, Italians, Chinese, and Mexicans—were carriers of cholera, leprosy, smallpox, typhus, and more. Such perceptions led to a range of morally and medically questionable admissions policies, including invasive examinations and tests, treatments, quarantines, blanket exclusions, and sometimes deportation. In recent decades, disease outbreaks have prompted new government actions. Most recently, a 2003 SARS epidemic in Asia led to airline passenger screening for the illness, and SARS was designated a disease of public health concern for immigration admissions purposes. Several outbreaks of influenza in recent years and other diseases have prompted similar immigration responses. Several enduring diseases that have been treatable for many years —namely TB and HIV—figure prominently in recent immigration policy. TB, a dominant health concern in the late 18th through 20th centuries, resurfaced as a key component of immigrant and refugee screening in the 1970s. The emergence of new drug-resistant strains in the 1990s has raised new concerns about the disease, prompting the implementation of improved and updated TB testing, most recently in 2009. Today, only those who test positive for infectious TB are inadmissible on health-related grounds. The government also took many steps during the late 1980s and 1990s to stop the spread of HIV. The disease became by regulation a basis for inadmissibility in 1987, and noncitizens diagnosed with HIV were not permitted to legalize under the 1986 Immigration Reform and Control Act (IRCA). In 1993, Congress voted to include in the INA a statutory admissions bar for noncitizens with HIV infection, and by that year, all green-card applicants were tested for HIV. Those infected with HIV were denied a visa or entry into the United States, unless they could obtain a waiver. While many defended the law and argued it would save lives, others saw it as ineffective and discriminatory toward the lesbian, gay, bisexual, and transgender (LGBT) community and toward certain nationality groups. In a significant victory for civil-rights and LGBT activists, the bar was lifted in 2010 and HIV was removed from the CDC’s list of diseases of public health significance. Given that the Ebola virus has foreign roots, its outbreak has inevitably created ripples in the U.S. immigration debate. Public anxiety about the disease is sure to add to already heightened concerns about border security touched off this summer by the surge of child and family migration from Central America. Talk of a travel ban from West Africa has figured in a number of congressional midterm election campaigns. Moreover, some members of Congress have suggested that illegal border crossers could bring Ebola to the United States if more is not done to secure the border. While calls for increased border security have become louder, it is becoming clearer that the notion that border and immigration controls can stop the spread of disease is outdated. The concept of health-related immigration restrictions dates to a time when international travel was limited. For the United States, international travel was essentially a one-way phenomenon—as U.S. citizens rarely went abroad and those entering the United States (and at risk for bringing new disease), were foreign nationals. The paradigm has shifted radically. There are billions of trips annually across international borders, including nearly 1 million international passengers arriving daily in the United States. As the Obama administration’s decision to screen all incoming passengers from West Africa—including U.S. citizens—demonstrates, it is not only foreign nationals who pose a risk for the spread of disease. Isolating countries or foreign nationals, once considered an appropriate response, may no longer match the realities of contemporary life. Obama Administration Announces Haitian Family Reunification Parole Program. On October 17, the Obama administration announced the Haitian Family Reunification Parole (HFRP) Program, intended to speed up family reunification for certain Haitian nationals with relatives who are U.S. citizens or lawful permanent residents. The HFRP will offer eligible Haitian beneficiaries, who already have approved family-based immigrant visa petitions and are currently in Haiti, an opportunity to relocate to the United States under parole status up to two years before their visa priority dates become current. They will also be eligible for work authorization until they adjust to permanent resident status. Most Haitian nationals who are in the same situation but already living in the United States have been granted similar protections through the Temporary Protected Status program. The HFRP is set to begin in early 2015. In 2007, a similar program called the Cuban Family Reunification Parole program was established for certain Cuban nationals. Under the Immigration and Nationality Act (INA), the Homeland Security Secretary is authorized to parole into the United States certain individuals, on a case-by-case basis, for urgent humanitarian reasons or significant public benefit. 2016 Diversity Visa Lottery Opens. Online registration for the Diversity Visa 2016 Program (DV-2016) began on October 1. The program, often referred to as the “green card lottery,” makes available up to 55,000 diversity immigrant visas (“green cards”) annually. Diversity visa recipients are drawn randomly from all submitted applications, which number in the millions annually. Applications are open to foreign nationals from select countries that have sent fewer than 50,000 immigrants to the United States in the preceding five years. Applicants must meet certain educational or work experience requirements. Registration will end on November 3. Temporary Protected Status Extended for Nicaragua and Honduras, Deferred Enforced Departure extended for Liberia. On October 16, Homeland Security Secretary Jeh Johnson announced the extension of Temporary Protected Status (TPS) for nationals of Nicaragua and Honduras through July 5, 2016. Individuals from those countries who already have TPS have been given 60 days from October 16 to December 15, 2014 to re-register. Both Honduras and Nicaragua have been designated for TPS since January 1999, after the region was devastated by Hurricane Mitch. Since 1990, the United States has granted TPS, which includes protection against deportation and permission to work, to nationals of designated countries that are deemed unsafe for repatriation due to ongoing armed conflict or a natural disaster. Currently, eight countries are designated for TPS status–El Salvador, Haiti, Honduras, Nicaragua, Somalia, Sudan, South Sudan, and Syria. On September 26, President Obama announced an extension of Deferred Enforced Departure (DED) for Liberian nationals. The extension will run for 24 months, effective October 1, 2014. Due to armed conflict and civil unrest, Liberia was designated for Temporary Protected Status (TPS) until country conditions improved in 2007. Since that time, Liberians who were originally granted TPS have been protected from deportation under DED. Liberia is currently the only country covered by DED. DED status offers similar protections afforded to TPS recipients. MAVNI Program Expanded to DACA Beneficiaries. On September 25, the Department of Defense (DOD) announced that a small number of unauthorized immigrants will have an opportunity to join the military. The new rule expands an existing program called Military Accessions in the National Interest (MAVNI), which is limited to lawfully present foreign nationals with high-demand skills, mostly rare foreign language expertise or specialized health-care training. Those who enter the program can apply directly for citizenship without first being a lawful permanent resident. DOD announced that the program will now be open to recipients of Deferred Action for Childhood Arrivals (DACA) who also qualify under MAVNI’s requirements. Thus, in addition to having successfully applied for DACA as a young adult who came to the United States prior to his or her 16th birthday, MAVNI applicants will need to speak one of about three dozen languages, such as Arabic, Hindi, Korean, Nepalese, Pashto, Russian, Swahili, or Uzbek, or be a licensed doctor or dentist in certain specialties. The MAVNI program is limited to 1,500 recruits per year and it is unclear how many slots will be allotted for DACA recipients. HHS Allocates $9 Million to Lawyers for Unaccompanied Children. On September 30, the Department of Health and Human Services (HHS) announced that it would allocate $9 million over the next two years to provide legal representation for unaccompanied child migrants in the immigration system. The funds were awarded in two grants to the U.S. Conference of Catholic Bishops and the U.S. Committee for Refugees and Immigrants. These funds are expected to provide legal representation to about 2,600 unaccompanied children in the Baltimore/Arlington, Dallas, Houston, Los Angeles, Memphis, Miami, New Orleans, and Phoenix regions. U.S. Supreme Court to Hear Case on Consular Adjudication. The U.S. Supreme Court will hear the Obama administration’s appeal of a 9th Circuit U.S. Court of Appeals decision in Kerry v. Din. The case concerns the rights of a U.S. citizen petitioning for an immigrant visa for her husband; the husband was denied a visa at a Department of State consular post abroad. Currently, under the doctrine of consular nonreviewability, a consular officer’s decision to grant or deny a visa is not subject to judicial review. As a result, consular officers may exercise their discretion without providing an explanation. At issue in this case is whether the U.S.-citizen spouse is entitled to challenge the denial in U.S. court and seek the government’s explanation for the basis to deny. Department of State Issues Changes to J-1 Visa Program. On October 6, the Department of State published a new final rule aimed at protecting the rights and working conditions of foreign nationals who come to the United States as exchange visitors on J-1 visas. The rule introduces changes to better monitor sponsor compliance of their obligations to J-1 workers. Currently, each sponsoring employer must appoint a Responsible Officer (RO) and as many Alternate Responsible Officers (AROs) as necessary to carry out the requirements of each program. Under the new rule, current and future applicants for RO and ARO positions will be required to undergo criminal background checks. They will also be required to have three years of relevant experience. In addition, sponsors are required not to leave these positions unfilled for more than ten days, increase minimum insurance coverage, and submit regular independent management review audits. Alabama Settles Last HB 56 Lawsuit. Alabama has settled the last lawsuit related to its 2010 immigration enforcement law, HB 56. The Alabama law was widely regarded as the nation’s strictest anti-illegal immigration law. HB 56 was contested from its enactment and many of its provisions never went into effect because they were blocked by federal courts. In the most recent settlement, the state agreed not to enforce a provision of the law requiring state officials to publish a list of people known to be unlawfully in the country. Former New York Assemblywoman Sentenced for Marriage Fraud. On October 3, a former New York State lawmaker was sentenced to one year in prison for committing marriage fraud. The former assemblywoman, Gabriela Rosa, admitted in June in federal court in Manhattan to paying $8,000 to earn a green card through a sham marriage with a U.S. citizen in 1996, and lying to immigration authorities for years. She is a native of the Dominican Republic, became a U.S. citizen in 2005, and was elected to the New York Assembly in 2012. Under a plea deal, Rosa resigned from the Assembly and is barred from seeking public office in the future. Federal authorities have stated that despite the fraud, they will not move to denaturalize or remove her from the United States.